Douglas Orville Culpepper (#6831), compiler, e-mail address or e-mail address, Douglas Orville Culpepper website & e-mails, Rootsweb: WorldConnect (online family tree), 2000-2007. Louisiana Secretary of State / Division of Archives, compiler, Louisiana Statewide Death Index, 1900-1949, Online database at Ancestry.com, 2002. Robert B. Culpepper, 29 Jun 1920, 68 years, Caldwell Parish, LA. R. B. Culpepper, Son, M, 15, S, LA/LA/LA, Laborer, Farm. The Advocate, Baton Rouge, Louisiana. Obituary of Mabel Fisher "Mamie" Culpepper, published 15 Jan 2008. 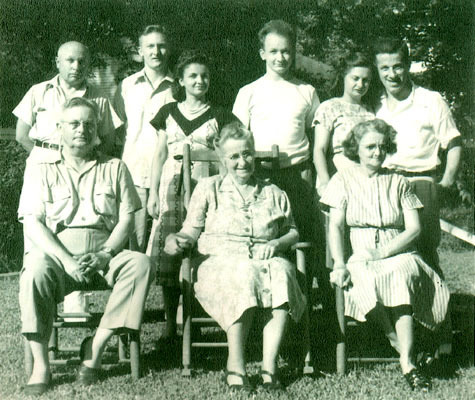 Back, left to right: Emma Katherine Clark Culpepper, Thomas Elbert Culpepper, Thomas Jefferson Culpepper, David Bartow Culpepper, John Ernest Melton, Leta Belle Culpepper Melton, John Melton, Maud F. Cabbiness Culpepper, and Cody Bryant Culpepper. 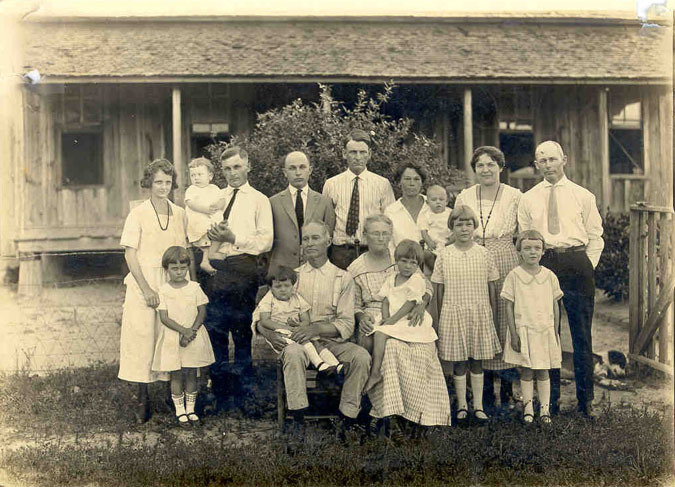 Front, left to right: Katherine Inez Culpepper, Martha Blanche Culpepper, Elbert Bartow Culpepper, Martha Etta Enox Culpepper, Nelwyn Melton, Hazel Culpepper, and Florine Culpepper. Front row, left to right: Thomas Jefferson Culpepper, Stella Maud (Wood) Clark, Emma Katherine Culpepper. Family Group Sheet prepared by Mrs. Eileen R. Vela, 268 Aragon Avenue, Los Alamos, NM 87544, and found in the Culpepper family file at the Tomkins Library of the Old Edgefield District Genneaological Society, Edgefield, SC. E-mail written 2005 - 2013 to Lew Griffin from ID: 41492 Eileen Vela (Mrs. Octavio Vela), New Mexico, e-mail address. Joe Culpepper, Son, M, 6, LA/TX/TX. Thomas J Culpepper, died 4 Apr 1962 in Harris Co., TX. Emma K Culpepper, Female, died 26 Oct 1978 in Harris Co., TX. Obituary* say 11 Dec 2016� Born Martha Blanche Culpepper in Longview, Texas, on July 28, 1919. She passed at 97 years young! We called her "Mudder." Mother wrote this about her husband (Bob): "My wonderful partner of 57 years (lacking 25 days of 58 years), died April 3, '04." Now, she is happy to be back with her special love. She missed Daddy so. Don't be sad, because she died. Be happy that she lived and enriched all our lives! Born in Longview, Texas, a town that our family helped found after moving west from Alabama. She lived in Shreveport, Louisiana, until the family moved to Houston when she was about twelve. She graduated from John H. Reagan High School. 1) Blanche was such an amazing lady and always so positive. I am so grateful that I got to know her. 2) We have so many wonderful memories of Blanche – she always lit up every room she entered. 3) Blanche was an amazing person. She lived life to the fullest – she will be missed. 4) I remember her as such a genteel and gracious woman! 5) Thank you for allowing us to be part of her life. She will always be my pretty li'l lady. Mother was a testimony to the Culpepper strength, integrity, & longevity - her family traces back to the 900's, earlier, through DNA testing, to the Vikings. Culpepper is a very famous English family name. The Culpeppers helped found the Colonies. She was a member of DAR & UDC. Mother & Daddy loved to cruise & they shared that love with their granddaughter, Kimberly. For some reason, the two of them wanted to cruise on "The X Boat" (Celebrity), but never made that wish come true. Octavio & Eileen took that cruise for them and drank many a toast in their name. from record of birth certificate & doctor's receipt. Martha Blanche Culpepper and Robert Reading Roth are the parents of Eileen Gayle Roth, Female, born __ 1949, and Janet Sue Roth, Female, born __ 1951, both in Harris Co., Texas. Obituary of Joseph Franklin Culpepper (#41489), published 31 Oct 2012. Find A Grave Memorial# 174933096. Funeral services for Mrs. Vannie Culpepper, 87, who died at her home at 519 Fannin Street Saturday morning, will be held at 2:30 p.m. today at Rose-Neath chapel. The Rev. Rowland E. Crowder, pastor of the Central Baptist Church of Springhill will officiate. Mrs. Culpepper was born and reared in Lincoln Parish. Her Parents moved to Lousiana from Georgia. Her father was a captain in the Confederate forces during the War Between the States. She lived in Claiborne Parish before moving to Shreveport 20 years ago. She was a member of the Baptist church and the widow of Billy Culpepper who died 59 years ago. Surviving are one daughter, Mrs. Ola Holland, Minden; two sons, Baylor and Leether Culpepper of Shreveport; one sister, Mrs. Rosie Hicks, Mart, Texas; one brother, Hardy Pardue of Dry Prong; 14 grandchildren and seven great grandchildren. Pallbearers will be Billy Holland, Juston Holland, T.L. Slay, Claude Davidson, Clyde Howard and Ernest Cartwright. W. R. Culpepper (M) and E. J. Pardue, 15 Apr 1886, Lincoln Parish, LA, Book C, p. 70. ED 22, sheet 3, Ward 6. ED 36, sheet 11, line 4. Ola Culpepper and A. T. Holland, 10 Dec 1910, Claiborne Parish, LA, Book 13, Folio 022. Biography 28 Jun 1974� Recently, a tall, stalwart man walked in our store and said to me, "I'm Baylor Culpepper from Shreveport." I said to him, "The only Baylor I ever knew was the late Mr. Baylor Ray." He replied "That man is my namesake." Baylor Culpepper has many relatives here in this area. Ora Leggett, Charles and Mary Beth Griffin, Dalton Smith, and all the late uncle Marion Davis' family. Baylor Culpepper was born in 1890 near New Hope, the son of Bill and Hannie (Padue) Culpepper. His father died when he was three years old. His mother moved to Claiborne parish. Life was a struggle, he worked hard in his early life. But God has been so good to him. He became a brilliant and very successful real estate dealer. Most of all, a true dedicated Christian man. For 50 years he has been a member of the First Baptist Church of Shreveport. Baylor has used his talents in the Lord's service. A man to love and appreciate. I never will forget him after he left my store. He visited New Hope Cemetery where his father was buried 80 years ago. From there he went to Ruston and purchased the finest peaches on earth. He said he would return the last of June for more peaches and hoped to see an article I promised to write. Biography* � When he signs his World War I draft registration card on 5 June 1917, Baylor Culpepper, age 26, is living in Oil City, Caddo Parish, Louisiana, where he is a rig builder for S.R. Zays & Company. Culpepper, who is single but supports his mother, is 6'2" tall, and slender, with blue eyes and blond hair. In 1920, twenty-nine-year-old Gladys is living with her husband, oil-field rig-builder Baylor Culpepper in Homer, Claiborne Parish, Louisiana. Living with them are Ernest L. Moody, who shoes horses, and his wife, Ida. B. Culpeper, Head of family (Husband), M, 39, M, md@27, LA/LA/LA, Agent, Real Estate, Vet=WW. ED 96, sheet 20, line 4. E-mail written 15 Oct 2007 to Warren Culpepper from Leah McKin, e-mail address. Ruston Daily Leader, Ruston, Louisiana. Friday, 28 June 1974, p. 9, Greenville News, by Mrs. Harold Griffin. Billy Culpepper and Jessie A. Slay, 12 Dec 1910, Claiborne Parish, LA, Book 12, Folio 205. Lora French Culpepper, Dau, F, 15, S, LA/LA/IA. New Orleans Passenger Lists, 1820-1945, Online database at Ancestry.com. On the S.S. Sixola, sailing from Cristobal, C.Z. 3 Jul 1937, arriving at port of New Orleans, 12 Jul 1937: Grace Carter Culpepper, age 55, Female, Married, born 18 Aug 1881 in Eldora, Iowa, and residing in Crowley, LA, and Lora French Culpepper, age 22, Female, Single, born 18 Nov 1914 in Crowley, LA, and residing in Crowley, LA. The Crowley Post-Signal, Crowley, Louisiana. Obituary of Florence Norby Culpepper, published 16 Jun 2005. U.S. Army Personnel and Dependent Casualties, 1961-1981, Online database at Ancestry.com. Charles Curran Culpepper, Male, Caucasian, born 6 Jul 1951 in Crowley, Massachusetts (sic). Religion: Presbyterian. Private First Class, Active Duty Army. Died 1 Dec 1971 in the US from injuries sustained in a vehicle accident. Lora French Culpepper and Dan Dickman Washburn are the parents of Susan Grace Washburn, Female, born __ 1941 in Jefferson Co., Texas. Biography* � That Thomas Young was the father of the children listed is highly speculative. Chickahominy River adjoyning on Pagan Creeke bounded (Vizt.) from a gum the head of Botton of Crosse Creeke South .. to a corner Spanish Oake by Winters North ... to Warbertons corner saplins and along his Lyne South ... to Pagan Creek Swamp and over the said Swamp and downe the Southerly side of the said Swamp and Creeke to the mouth of Crosse Creeke and up it to the first mentioned gum. 250 acres of the said Land being formerly granted unto THOMAS YOUNG by Pattent, 5 Jan. 1658, and renewed in his Majesties name, 18 Mar. 1662, sold by the sd. Thomas Young unto Andrew Godian by deed, 6 June 1679, who dyed, found to Escheat., by Inquisition recorded by Col. John John Page Escheator Generall of Jas. City Co., 14 Oct. 1685 granted to Richard Bennett ... 27 April 1686. John Elock, Thomas Griffin, David Lacy, Wm. Knowles. Biography* � That John Young was the father of Francis and Edward Young is highly speculative. paid by John Howard of ye same place & County ... sell unto ye sd. their lives, by Wm. Sherwood Gent: late deceased) was given and granted unto ye sd. John Jarrett by deed 30 Dec. 1693 by ye sd. Dec'd relacon... 9 Feb . 1699 . Sealed & Signed Jn. Jarrett. Wit. : JOHN YOUNG, Rec. Court, James City Co., 6 May 1700. Test C: C: Thacker Cl Cur. YOW No. 15, p. 540. Biography* � THOMAS YOUNG was on the Quit Rent Roll of Virginia 1704/05 in James City County, VA.
EDWARD ELLERBY, 100 acs., James City Co., 16 Apr. 1683, p. 264. From James Riv., along line of Mrs. Nowell, &c. Part of 600 acs. granted William Haveat, 20 Oct, 1661, who bequeathed to William Strong, 26 Aug. 1663, who sold sd. 100 acs. to Stephen Butts, 8 Oct. 1675, who sold to sd. Ellerby, 17 Sept. 1677. Cavaliers & Pioneers, Vol. II, p. 258, from Patent Book 7. Charles Goss, 275 acres, James City County, lyeing on the North side of Moses Creek to begin at ye Lower side of Kerbies Creek a little above the mouth thereof and runs North ... to HENRY YOUNG's corner oake and thence along his and Thomas Bobby's marked trees ... thence South 39 d. Westly 163 cha: to a small Sapling on Moses Creek and down ye same to Kerbies Creeks mouth and over ye same to the place it began the land formerly belonging to Eddy Goss and since was found to Escheat ... Inquisition ... hands and seales of Henry Hartwell Deputy Escheator of the sd. County, 7 June 1681.. Granted to Chares Goss, 22 of December 1682. Wallis S. Culpepper, Son, M, 13, LA/GA/LA. Mrs. Winifred Culpepper Braswell passed away at Willis-Knighton Medical Center on Thursday, January 13, 2005 after a brief illness. Visitation will be held at Osborn Funeral Home on Saturday, January 15th from 12 noon until service time. Graveside services will begin at 1 p.m. at Forest Park Cemetery. Officiating will The Rev. Canon Jane W. B. Alexander, Canon Pastor of St. Mark's Episcopal Cathedral. Mrs. Braswell was born July 19, 1911 in Monroe, LA and had been a resident of Shreveport since 1950. She lived at the Waterford for over 5 years and loved her family, yard and flowers. Mrs. Braswell was preceded in death by her husband, Morton Reed Braswell, and brother, Dr. Walter Culpepper. She is survived by her three daughters, Gainor Braswell Daricek, Ann Braswell Fellers and husband, Chuck, and Carol Braswell Lang; grandchildren, Ashley Harris of Dallas, TX, Clayton Daricek of Chicago, IL, Caroline Jenkins of Baton Rouge, LA, Dr. Charles West, Jr. of Shreveport, Craig N. Lang, Jr. of Menlo Park, CA, Sally Weir of Shreveport, and Shannon DeFatta of Shreveport; and five great-grandchildren. The family requests that memorials be made to the Grace Home, 1035 Margaret Place, Shreveport, LA 71101 or the Humane Society Northwest LA, P.O. Box 52442, Shreveport, LA 71135. Published on January 15, 2005. Walter Shelley Culpepper Jr., M.D. The New Orleans Times-Picayune, New Orleans, Louisiana. Obituary of Mary Louise McLean Culpepper (#38611), published 14 May 2012. Obituary of Walter Shelley Culpepper, Jr., M.D. (#37078), published 1 Aug 1999. E-mail written Oct 2007 to Lew Griffin from Katharine Ventimiglia, e-mail address. ED 90, sheet 12, also in this household: Gertrude Daughtry (Apr 1891) and Conley Daughtry (Nov 1893), both children of Eula Culpepper Daughtry. 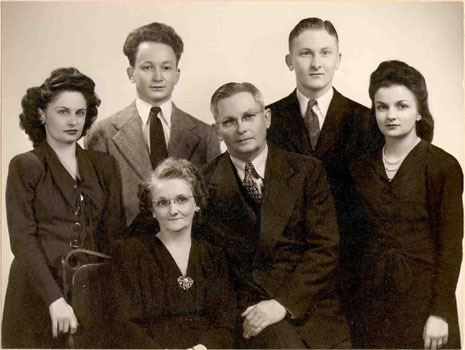 ED 104, family 17, also in the household Gertrude Daughtry, daughter of Eula. E-mail written 2005-2006 to Culpepper Connections from William Lee Carbrey Jr., e-mail address.